With my new years resolution of getting on top of our renovations, I thought I'd start to put together ideas for our bathroom. I seem to be drawn to the hexagonal tiles, with those tiles showing up in the top right photo and the bottom left. I love the shower over the bath, though I do wonder how you'd clean between the bath and the wall with that big gap and the shower screen covering the access? One has to think of these things! I also like a lot of photos with free standing sinks but where would you store your beauty products? Would you have a separate mirror near a vanity space for your beauty products or do you keep them elsewhere? I like being able to do my make-up in the bathroom and we don't have room for a separate vanity and freestanding sink so something like the bottom right picture might be better. Have you renovated your bathroom? What worked for you? Is there anything that you would have done differently now that it is finished? I'd love to know. The more input the better! 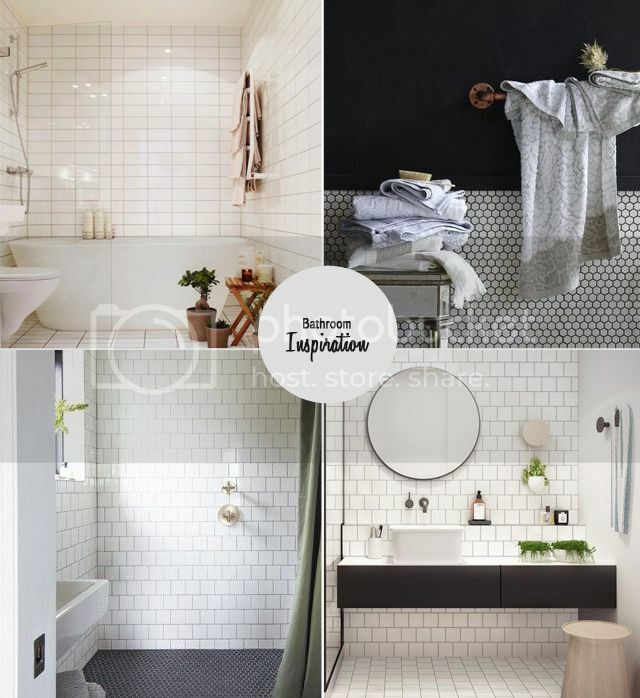 You can see more bathroom inspiration on my bathroom pinterest board.